Note: This blog post is also available on IBM DeveloperWorks. We're sharing another episode of The Future of Node series from Changelog. IBM and StrongLoop sponsored Changelog’s The Future of Node Spotlight series at Node Interactive 2016. Adam spoke with event attendees about Node.js and the Node community. 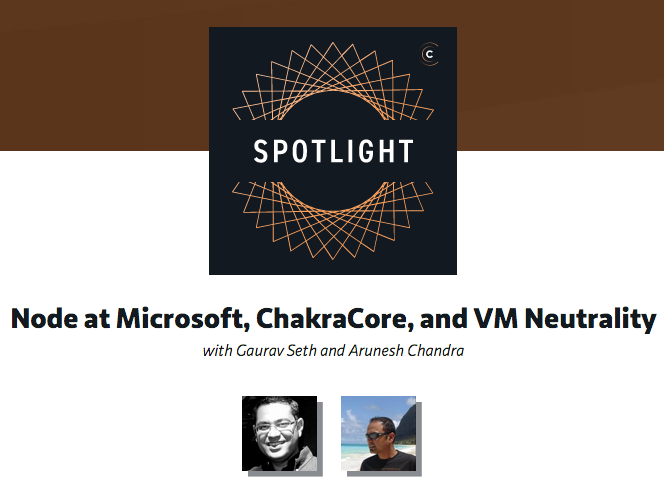 In this podcast, Adam discusses Node at Microsoft, ChakraCore, and VM Neutrality with Gaurav Seth and Arunesh Chandra. Changelog is a podcast and digital media company that tells developer-centric stories. They’re hacker to the heart. You may know them best from their popular podcast “The Changelog”. It's a weekly podcast that covers the technology and people of open source. It's about the code, the people, and the community.